Sagacity is not possible without language knowledge. Language knowledge is a preparation for knowing of culture, history, education, and humanity’s civilization. Language, in addition to a symbolic and systematic discipline of knowing and understanding of phenomena is also a tool for transferring of humans’ knowledge and human kinds’ savings to other human kinds. Transferring and achievement of knowledge is not possible minus language knowledge. Basically, humans’ understanding and wisdom discipline are in a permanent relation with lingual and written symbols and finally language. Therefore, knowing the culture and civilization of China, as a society with diverse culture and modern knowledge, and acquaintance with different capacities of that country as a neighboring country is merely possible through knowledge of its language. 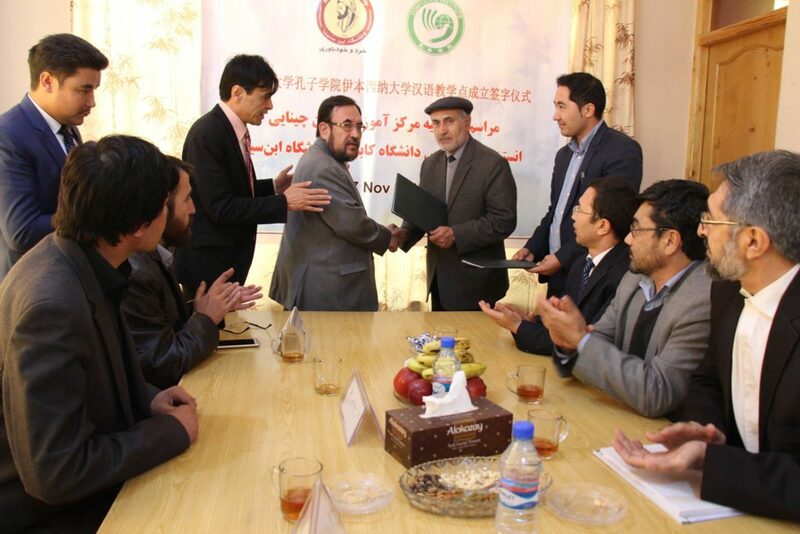 Thus, Avicenna University, with establishment of Chinese Language and Literature Department under the university’s international languages institute, signed a cooperation contract with Confucius Organization branched in Kabul University under this university’s Language and Literature Faculty on Thursday, 17, Nov 2016 with presence of honorable president of Avicenna University, Dr. Mohammad Amin Ahmadi; academic-schooling vice chairmanship, Prof. Dr. Zaker Husain Ershad; official-financial vice chairmanship, Prof. Mohammad Jawad Sultani; Chairmanship of Master’s Education, Prof. Dr. Ghulam Haidar Allama; honorable head of Chinese Language and Literature Department, Mr. Ahmad Jawed Beheshti; honorable deans of faculties; and other honorable lecturers of Avicenna University; and honorable Prof. Dr. Mohammad Aslam Nasimi, Dean of Chinese Language and Literature Faculty of Kabul University; president of Confucius Organization in Afghanistan, Prof. Li Xua Yung from China country side; and honorable Prof. Mohammad Yusuf Rahnaward, executive head of Confucius Organization. This contract was signed in main building of Avicenna University located in Karte Char, Kabul. This cooperation contract was emphasized on academic and cultural cooperation especially on learning Chinese Language in Avicenna University and Afghanistan society. First Mr. Ahmad Jawed Beheshti, who the preliminary meeting of this occasion was done as a result of his perseverance and determination, in addition to introduction of the Professors and lecturers and guests of this session, spoke about the positive and great effects of this protocol on future schooling programs of Chinese Language and Literature Department and mentioned this session as a noble ignite for continuation of activities of Chinese Department. Dr. Mohammad Amin Ahmadi pointed about importance of academic and economic relations between Afghanistan and China. Dr. Zaker Husain Ershad gave fully certainty from preparation of Avicenna University and existence of human resources and equipped academic faculty members of this university to Confucius Organization. Prof. Mohammad Jawad Sultani spoke about relations and historical importance of China in the past and challenges ahead present Chinese civilization. Mr. Baqer Niazi, head of Avicenna International Language Institute, also delivered summarized and efficient report of activities of this institute about English, German, French, Russian, Turkish, and most especially Chinese Languages. Mr. Li Xua Yung, in addition to declaration of his happiness about signing this protocol, emphasized that he felt he has signed the most significant agreement with one the most reliable universities in Afghanistan and appreciated the decent and historical knowledge of Avicenna University’s lecturers about China, culture and Chinese civilization. At the end, both sides appreciated and thanked Mr. Ahmad Jawed Beheshti and his colleagues in Chinese Language and Literature Department of Avicenna University because of the efforts, cooperation, perseverance, and determination of them for provision of easiness for signing this protocol. With no doubt, this is not a small pace towards wisdom and self-awareness.